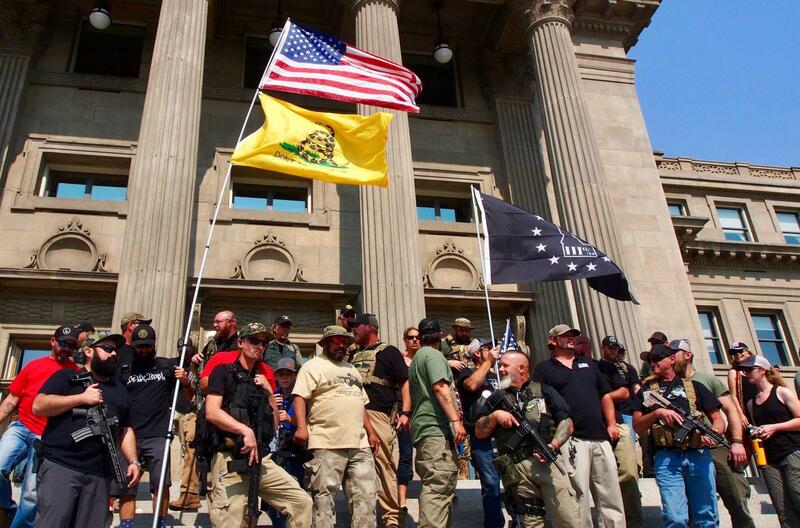 Gun rights activists, including members of the anti-government group The Three Percenters, stand on the steps of the Idaho State Capitol during a gun rights rally in September 2018. Three Percenters have been part of an effort by “no compromise” gun rights activists to make it harder to prosecute those who claim self-defense in shootings under proposed "stand your ground" bills. Laws that allow people to use deadly force when threatened — without requiring them to first retreat — have been sweeping across the nation for over a decade. Today, depending on your definition, “stand your ground” is law in well over half of American states. Florida passed its so-called “stand your ground” law in 2005. In the years since, several high-profile shootings, including the 2012 killing of unarmed black teen Trayvon Martin in Florida, have put “stand your ground” laws in the spotlight. All the while, gun rights groups continue to pressure lawmakers in states across the country to enact new “stand your ground” laws and to strengthen laws already on the books. In many states, “stand your ground” has proven to be such a controversial political issue that it has pit far-right gun rights groups against conservative, gun-friendly politicians seen as insufficiently pro-gun by their rivals. And so far-right gun groups have adopted an effective strategy to advance their cause: using targeted campaigning to knock out state politicians who don’t pass their strict gun rights purity tests, even those who get plaudits from the National Rifle Association. Loertscher lost his primary after a state gun rights group, the Idaho Second Amendment Alliance, backed his opponent and painted Loertscher as a “gun grabber.” This, after Loertscher killed an expansive self-defense bill, Idaho House Bill 444, that would have greatly extended the definition of acceptable use of deadly force. 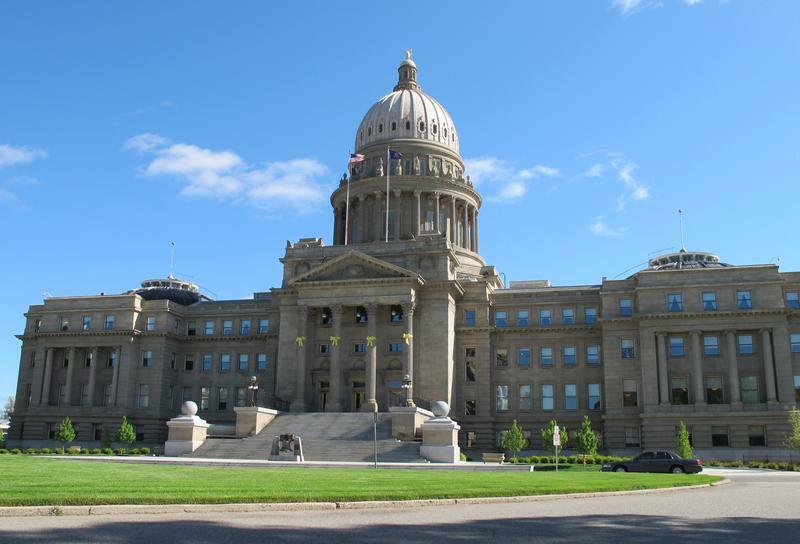 The Idaho Second Amendment Alliance was the biggest backer of Idaho’s House Bill 444. If it had passed, it would have been one of the most expansive “stand your ground” bills in the country, forcing local governments to compensate shooters found not guilty in a self-defense case. This is part of a larger effort by the Alliance to push Idaho gun laws further to the right ahead of what they fear is an increasingly leftward shift in the population as more people move to Idaho from California, Oregon and Washington. House Bill 444, the “stand your ground” bill pushed by the Idaho Second Amendment Alliance, was so permissive of deadly force it alarmed even some conservative Republicans. Idaho State Rep. Christy Zito at her farm in Hammett, Idaho. Earlier this year Zito sponsored a bill that would have given Idaho among the most permissive stand your ground laws in the country. The bill failed, but the legislator who killed it lost his seat. 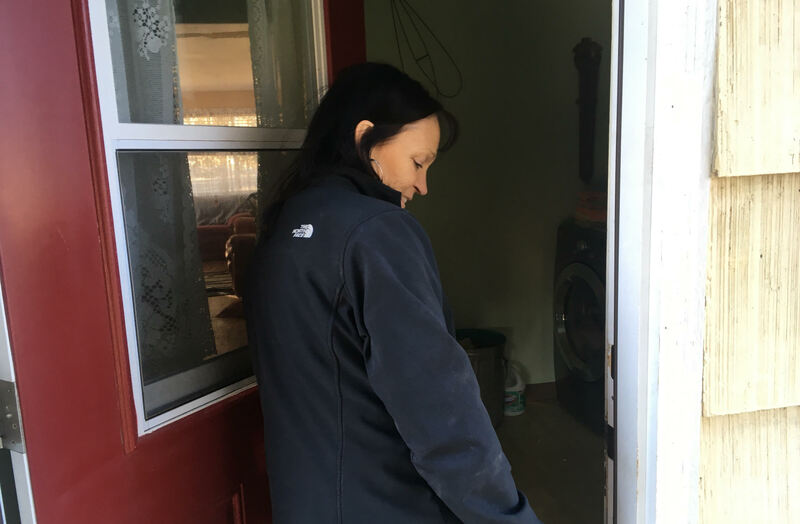 But the group found a friendly legislator in Idaho Rep. Christy Zito, who knocked out an incumbent two years ago with the help of the Alliance. Zito, who sponsored House Bill 444, the Alliance’s more expansive “stand your ground” bill, said that self-defense philosophy is rooted in something even grander than the U.S. Constitution. “That right is a God-given right,” said Rep. Zito. The Idaho Second Amendment Alliance is part of a loose consortium of state gun rights groups fashioned after the national organization Gun Owners of America and its “no compromise” approach. The groups share resources, have nearly identical website templates and often publish each other’s news stories on their websites and social media. One of the affiliated groups, Georgia Gun Owners, painted then-gubernatorial candidate Democrat Stacey Abrams as a “gun-grabber” on social media, a term state gun groups reserve for anyone who fails their strict Second Amendment litmus test. In Ohio, where Republicans control the legislature and governorship, outgoing Republican Governor John Kasich has been a favorite target of the local affiliated group Ohio Gun Owners, especially since he vowed to veto “stand your ground” legislation. 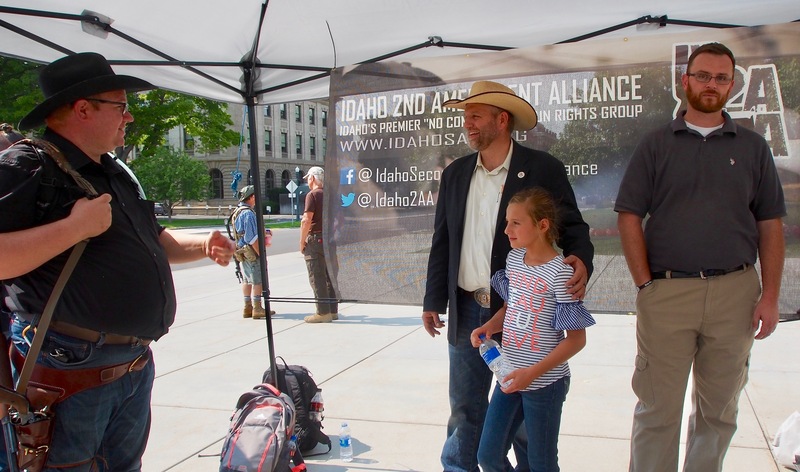 Idaho Second Amendment Alliance president Greg Pruett, right, stands next to Ammon Bundy during a September 2018 gun rights rally in Boise, Idaho. Pruett’s group has been pushing for lax gun laws and helping to oust politicians who stand in the way. Bundy led an armed takeover of the Malheur Wildlife Refuge in Oregon and has become an inspiration to militias and other anti-government groups. An analysis done by the Idaho Attorney General’s Office found many potential issues with the bill the Idaho Second Amendment Alliance supported, House Bill 444. They found the language vague and took issue with the potential expense associated with reimbursing court costs to anyone found not guilty of a shooting for reasons of self-defense. Nonetheless, Pruett, president of the Idaho Second Amendment Alliance, and his backers put pressure on Loertscher. The dispute culminated in a heated exchange between the legislator and several armed members of the anti-government group The Three Percenters in a hall of the Idaho State Capitol last February. Pruett said he and his backers never go beyond political pressure, but pressure they do. He and his confederates draw inspiration from Confrontational Politics, the 2009 book by Gun Owners of America founder H.L. Richardson. In addition to being confrontational, the Idaho Second Amendment Alliance dropped more than $11,000 in targeted spending on Idaho legislative races that rarely attract much money, and — by Loertscher’s own accounting — tipped his race. The irony for Loertscher is that he did support the other “stand your ground” bill, Senate Bill 1313, which, despite strong opposition, ultimately became Idaho’s “stand your ground” law. But in a sign of what a scarlet letter any whiff of anti-gun sentiment can be in Second Amendment country, even Idaho’s conservative Republican governor and critic of the bill, Butch Otter, let Senate Bill 1313 become law without his signature. Though he opted not to run for re-election, Otter chose not to veto the more measured “stand your ground” bill. The bill became law in Idaho in July 2018. The 2018 midterm elections in November further emphasized the changing national conversation: More than 80 percent of candidates with endorsements from the pro-gun control organization Everytown For Gun Safety won their races. In more conservative states like Idaho, candidates from both parties made clear their priority was defending gun owners’ rights. The political calculus is different in some Republican strongholds according to Lee Drutman, senior fellow at the New America think tank’s political reform program. “There are parts of the country where people really love their guns and those tend to be rural conservative parts of the country where being anti-gun is political poison,” said Drutman. Idaho’s more than 100-year-old sandstone Renaissance Revival Capitol building lies at the center of downtown Boise and is easily accessible, with very little security. The open access is a point of pride among state politicians. Regular Idahoans, many of them carrying weapons as a matter of course, roam the halls to bend their representatives’ ears; there’s a trust between the powerful and the governed. The Idaho Capitol in Boise, Idaho. With many state legislatures controlled by Republicans, gun policy debates often end up being inter-party struggles. More and more groups are drawing hard battle lines. Idaho is no exception. Republicans have long held a stranglehold over the state legislature and have comfortable supermajorities in the house and senate. As Tom Loertscher discovered, however, the argument over “stand your ground” sometimes crosses the line from friendly disagreement to political brawl. And as activists from groups on the right, like the Idaho Second Amendment Alliance, become more strident in their demands for Republican purity on gun issues, Loertscher worries that disagreements are metastasizing into something uglier.